The ANSI / ESD Association standard used in the United States to test that an ESD Mat is “static dissipative” is ANSI / ESD S4.1. “Worksurfaces – Resistance Measurements“. This requires the use of a Surface Resistivity (ESD) Meter to perform both resistance-top-to-top (RTT) and resistance-to-groundable point (RTG) tests. Resistivity and Resistance are not technically the same thing. Resistivity is measured in ohms / square. Resistance is measured in just ohms. Theoretically, surface resistivity is ten times greater than resistance. For example, a material that measures 108 ohms in surface resistance should measure 109 ohms / square in surface resistivity. Our rubber ESD mats are dual-layer: static dissipative on the top, and conductive on the bottom. A material is static dissipative if it is more than 1 x 106 ohms / square, which is 1 million ohms per square, and less than 1 x 1012 ohms / square, which is 1 trillion ohms per square. For testing purposes, per ESD TR20.20, the correct unit of measurement is surface resistance (just ohms). ANSI / ESD S4.1 guidelines (section 8.0) state that point-to-point (RTT) tests should find the mat has greater than or equal to 1 x 106 ohms of surface resistance. • Push and hold the Test Button until the surface resistance reading is displayed. • If the most used area is not obvious, use two points near the center of the surface. 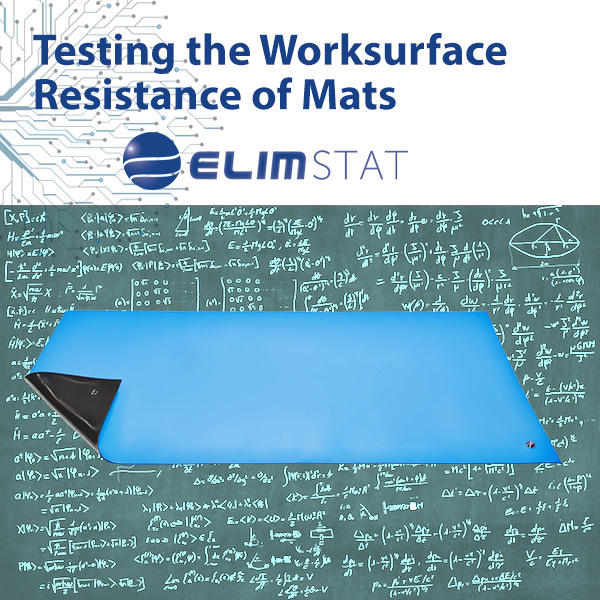 ANSI / ESD S4.1 guidelines (section 8.0) states that resistance-to-groundable point (RTG) tests should find the mat has between 1 x 106 and 1 x 109 ohms of surface resistance.